Got my copy of the Meg today which was a pleasant surprise. Will do a full run down soon (Lawless, great, The Torture Garden, my top story in the issue) but the main thing I wanted to mention was the new bag that the Meg comes sealed in, which started with the last issue. The fact that it's now semi-opaque means you can't really see the cover very well and I'm sure this isn't really going to make it stand out on the newstand or help sales. Being shrinkwrapped every issue (I know it's to keep the floppy in there!) , I always thought must hurt sales, since you can't have a look through it to see if you want to buy it. Don't think this new bag will help. Probably cheaper to produce but not great for the covers. Thoughts? Re: Meg 407 - Storm Rider! I was thinking maybe that but it still looks bad on the shop shelves. Screw the planet! I want to see the covers, dammit!! Hadn't considered that... shrink-wrapped probably deters casual buyers and semi-opaque bags worsen this? Looks odd in WH Smith's. Does stand out, but in a top-shelf oo-er kind of way. I think that's quite striking, and it's a shame to cover it up. Bugger the environment, it must be worth killing a few dolphins or whatever so that more people can see it! I made regular unplanned trips in WH Smiths for the last month to gawp at Cliff's amazing cover on the previous Megazine and I can't say it hurt the visibility a great deal on the shelf. What a great cover to start off. 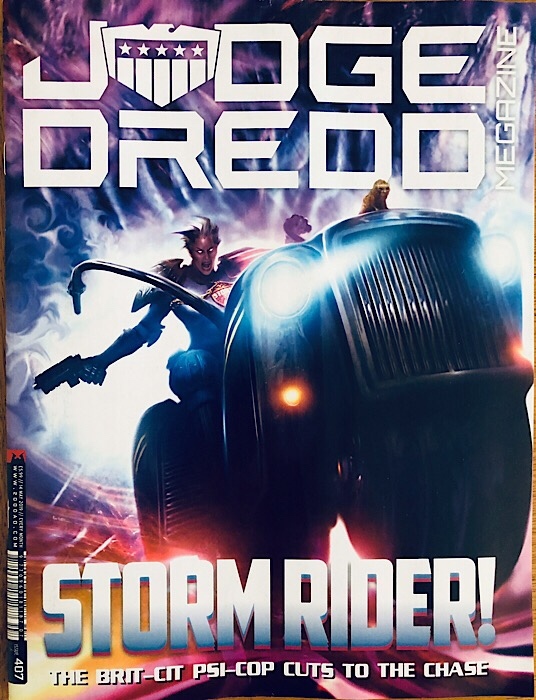 The Dredd story is very good. Dryer’s art for me the best work he has done for both AD and the Meg. Lawless just keeps on delivering. The highlight gain of the Meg. As much as it is Abnett’s storytelling and it is wonderfully supplement by the detailed work of Winslade pencil. Torture Garden is highly enjoyable. Blunt and Storm Warnings is not bad but not as great as the other strips. The meg is a good publication and stories like Lawless/Torture Garden makes it a great purchase.